Va a finire che aveva ragione MOL... anche se non credo che la situazione sia così drammatica. Con molta calma, hanno pubblicato i dettagli del Q3. La cosa che più balza all'occhio, è che il totale delle liabilities è schizzato in un anno da 38.4 a 51 MLDNOK, 2/3 dei quali sono prestiti (la maggior parte a lungo termine). Per la cronaca i 51 MLDNOK corrispondono a circa 5.32 MLD€. Praticamente una bomba ad orologeria. Immagino la gioia di chi, pur di non farla esplodere rimettendoci un capitale, è costretto ad alzare la posta prestando altri soldi. Vedremo fino a che punto il gioco andrà avanti. Non capisco molto di dati finanziari, ma dal punto di vista training ed assunzioni Norwegian ha bloccato tutte le assunzioni del 2019 in Cockpit con persone che avevano giá firmato un contratto di lavoro. Inoltre pare che non rinnoveranno contratti di piloti assunti tramite agenzie esterne. Su Norwegian ci sono tante speculazioni riguardo una possibile vendita a IAG, al momento onestamente ho difficoltá a farmi un´idea concreta di quanto queste notizie e decisioni siano parte di una programmata vendita imminente e quanto invece l´ossigeno stia finendo velocemente. 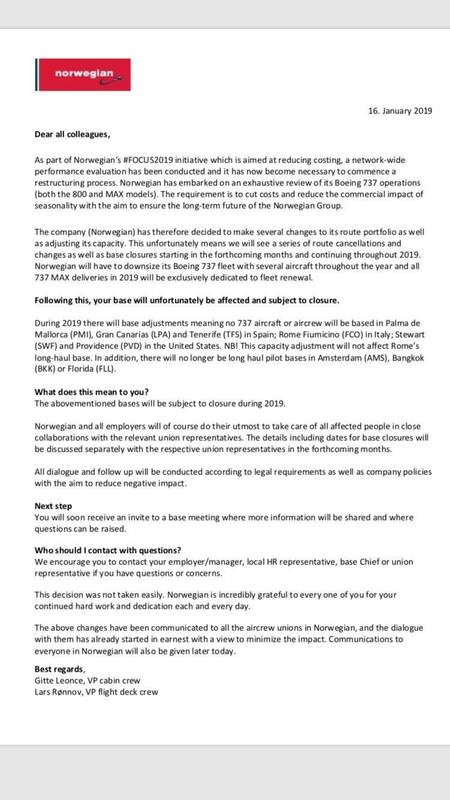 Norwegian Air Shuttle ASA (“the Company”) would like to give the financial market a year-end update. To meet the competitive environment in a period with seasonally lower demand in Europe, the Company has made several changes to its route portfolio as well as adjusted its capacity. Combined, these measures should improve the financial performance from the start of 2019. In addition, the Company has launched an extensive cost savings program, #Focus2019, which will contribute to estimated savings of minimum NOK 2 billion in 2019. Six weeks into the program, we have already identified significant savings. The Company will update the market with results from #Focus2019 in connection with the announcement of the results for the first quarter of 2019. As previously communicated, Norwegian’s long-haul operation has been disrupted by challenges with the Rolls-Royce engines on the Dreamliners. The Company has now reached an agreement with Rolls-Royce which will have a positive effect from the first quarter of 2019. The commercial terms of the agreement remain confidential. The Company is pleased to announce that the financing for all aircraft deliveries for the first half of 2019 is secured. This also includes refinancing of one of the delivered Dreamliners, resulting in a positive liquidity effect of NOK 275 million in December 2018. The process of divesting aircraft continues, and we experience significant interest in our existing fleet as well as future deliveries. The Company recently signed a letter of intent for the sale of two aircraft with delivery in the first quarter of 2019. The discussions about forming a joint venture for aircraft ownership also continues with full force. Sale and lease back o stanno proprio vendendo aerei ad altri operatori? Pare che sia appena stato comunicato a sindacati di piloti e assistenti di volo che la base 737 di FCO chiuderà l'1 aprile p.v. "Base 737 FCO" non vuol dire "base FCO"? Credo abbiano anche i 787, che evidentemente mantengono. Considerando che sulla NewYork (EWR) c’è il 777 Privilege fisso da mesi cosa è rimasto di lungo? Poi il routemap di Norwegian mi da questo da FCO per i mesi invernali e di lungo c’è solo la EWR. Messaggio ai colleghi di Norwegian (delegati sindacali Irlanda). A historic meeting was held today in Oslo between the Chairs of all the Unions, both Flight crew and Cabin crew, and senior management from Head Office in Fornebu. This meeting was scheduled in order to discuss the Focus2019 initiative and how we can all contribute to the effort to streamline and improve efficiency within the Norwegian Group. An initial presentation was provided by our CFO, Geir Karlson, who provided an update on the current financial situation of the Company. Due to the commercial sensitivity of the information I am unable to provide specific details other than to say that the situation could be better. Many options are being actively pursued in order to increase the liquidity of the Company. This was followed by a presentation by the Commercial department who went into the finer details of their role within the Company and provided an outline of the changes to the production across the network for the summer schedule. As most of you will have heard by now this included the information that there will be a reduction in the short-haul capacity (including MAX production) of 11 aircraft for the year. This has implications for bases in Spain, Italy and the U.S.A. Base bidding should open next week whereby all crew may bid for opportunities in both short-haul and long-haul bases in the hope that redundancies can be avoided. Furthermore, it is with much regret that I must also inform you at this time that the plan also includes a reduction in the MAX production out of Dublin from the 6 aircraft which will operate the summer schedule (commencing on 31stMarch) down to 1 (or maybe 2) aircraft as of 15th September 2019. This reduction will apply not only to the number of aircraft based in Dublin but also to both the Flight crew & Cabin crew complement. Consequently, in June the base bidding will open and Dublin based crew will be invited to bid for a position on either the long-haul fleet or an alternative short-haul base (IF any vacancies exist at this time). I fully appreciate that this news will come as a shock to many of you, as it did to me. However, it is important not to go into panic mode at this time and instead to await further developments. It is intended that the Company Council will commence further talks with the Company about these serious issues as they apply to the Dublin base over the next few days. We shall keep you fully informed of the progress of these discussions. In the meantime, I would ask you to treat this information as confidential and refrain from promulgating outside of the Company. If you have any questions regarding the above then please send them to me by replying to this Email and I will collate and release an FAQ sheet with clarifications. C'è poco da ridere sul pubblicare una comunicazione che influisce pesantemente sulle vite di molte persone nonostante la suddetta dicitura. Sono passate quasi 14 ore da quel post ed è ancora lì, bello in vista! Complimenti! Prendi il lato positivo della cosa: avevamo la conferma della notizia e la abbiamo data, tra una nocciolina e l’altra. Comprendo possa essere fastidiosa la cosa, sonic, ma sei l’unico che lega lo smile al destino dei lavoratori in modo del tutto strumentale e fuori luogo rispetto al senso della battuta. Qualche dato su una manciata di rotte di lungo DEC17-NOV18. Che margini operativi! Come facciano a proporre il Wi-Fi gratuito è un mistero...o un suicidio. Hanno aumentato l'indebitamento di 1.3 MLD€ nell'ultimo anno. Credo non serva aggiungere altro. ci sono dati anche se rotte in positivo (se esistono)?